These classic 1950s books will lead us into the second half of the twentieth century. 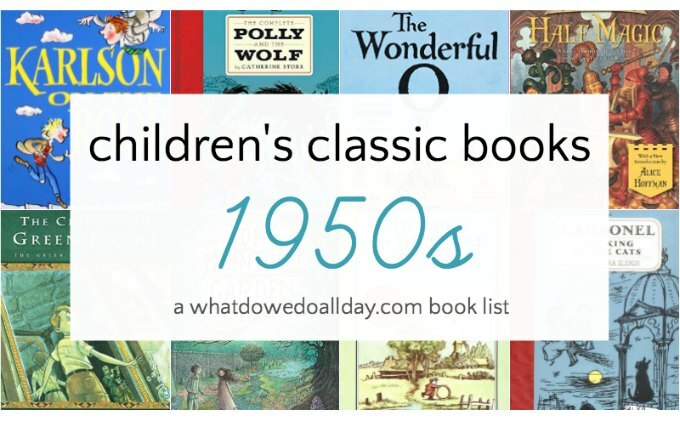 Some of the 1950s children’s chapter books on this list were favorite read alouds in our house and I’ve included a variety of genres, from fantasy to humor and realistic fiction. Also on the list, I have books from both American and European authors, so there is something for everyone! P.S. I also have a list of 1950s children’s picture books! The Family Under the Bridge by Natalie Savage Carlson. (1958) At Christmas time in Paris, Armand, a self-proclaimed hobo who loves his responsibility-free life, takes a homeless family under his protection. In doing so he decides it might not be so bad to have permanent ties after all. Read this sensitive, touching story with your children during the holiday season. The Children of Green Knowe by L.M. Boston. (1954) Tolly goes to live with his grandparents in their ancient but magical English manor house. He meets a few new playmates to keep him company. He discovers, however, they are not quite of this world. There are six Green Knowe books. Read them all. Half Magic by Edward Eager. (1954) This classic series should be read by everyone. A group of siblings discover a coin that grants only half a wish. The children must work together to make complete wishes and then navigate the unexpected outcomes. Delightful. The Wonderful O by James Thurber. (1957) If you are an island with the name Ooroo, you’d better hope that a nasty pirate doesn’t land on you and banish the letter “O” because when he d_es, y_u w_n’t be able t_ st_p the hilari_us cha_s. This book will be thoroughly appreciated by grown-ups, so put it on your read aloud list. Tom’s Midnight Garden by Phillipa Pearce. (1958) In the 1950s, Tom goes to live with his uncle and aunt where a clock strikes 13, there is a gorgeous but mysterious garden and his playmate is from the 19th Century. Beautiful, eerie, moving and wondrous. Clever Polly and the Stupid Wolf by Catherine Storr. (1955) We love this book, we’ve read it aloud multiple times! As you might guess from the title, Polly readily outwits a not-so-shrewd wolf who would like nothing better than to eat her for dinner. Storr’s storytelling ability is just as clever and witty as her heroine. A great read aloud for younger listeners. Karlson on the Roof by Astrid Lindgren. (1955) The author of Pippi Longstocking also wrote several amusing and charming books about a little man who flies around with a propeller attached to his back. Karlson is a little bit of a trouble-maker, but he is lots of fun. The Wheel on the School by Meindert DeJong. (1954) In Holland, Lina and her friends wonder why there are no longer any storks in their village. They work together to build a nest for the birds on the school, and in doing so discover their individual and collective strengths. I know that sounds boring, but I swear, it’s not! A Newbery Medal book with delightful illustrations by the late great Maurice Sendak. Carbonel: The King of Cats by Barbara Sleigh. (1955) This is the first book in a magical trilogy. Young Rosemary’s new cat turns out to be royalty and she and her friend, Jack, get caught up in an adventure and mystery in their quest to break the witch’s spell. The Hundred and One Dalmatians by Dodie Smith. (1956) Yes, it’s true! It was a book! And it’s much better than the movie! And, if you can believe it, it was written by the same author as the beautiful I Capture the Castle. Beware of abridged versions. Loved so many of these books as a kid. Yes, The Hundred and One Dalmatians is a fabulous read! And I have to reread The Family Under the Bridge–haven't thought of that one in ages. Great post! I admit that one reason I love The Family Under the Bridge because it takes place in Paris! Karlson on the Roof was one of my favorite books in the childhood completed with great Russian animated series 🙂 I actually liked it a lot more than Pippi. Fabulous list – I've only heard of some of these. I'm really curious about The Wonderful O – that one is ringing a bell. 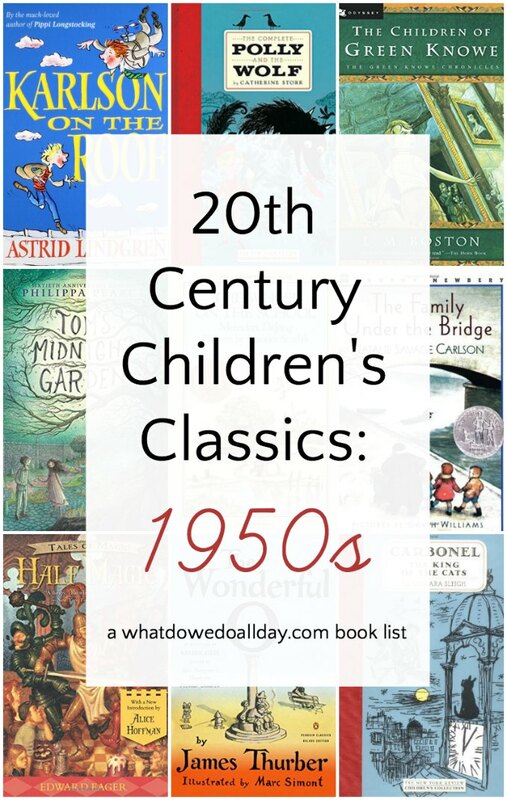 Some big favorites of N's and mine on this list: The Family Under the Bridge, The Children of Green Knowe, Half Magic. I'm putting the others on my TBR list! The only one I'm familiar with is Tom's Midnight Garden which I have on a TBR list for when my little guy gets a bit older, but we'll have to add some of these others as well. Clever Polly might be a good choice for you right now. These books sound fantastic, thanks for this list! You will enjoy them, I'm sure! What a great list – I can't believe I don't know 'The Wheel on the School'. It's a must-read for us as we spend part of the year in my husband's home town in Germany where they are doing exactly the same thing to lure back the storks (so exciting when you see one on a house roof!). I don't know Clever Polly and the Stupid Wolf or the Wonderful O but both sound like they would appeal to my boys. Don't know The Family Under the Bridge either but the others are all favourites. I can't imagine how many times I read Half Magic and The Green Knowe books and I can still remember the time in second grade when my teacher was reading us Tom's Midnight Garden and stopped for the day just before he stepped into the garden – I seriously don't think i could sleep that night wondering what he was going to find. The 101 Dalmations and Carbonel books were favourites too – at one point I think I forced our family pet cat to wear a crown I had made for him! Not sure if The Little Bookroom by Eleanor Farjeon qualifies as well-known but it was also a childhood favourite of mine. Also, want to put in a late bid for The Wind on the Moon by Eric Linklater – apparently that was writeen in the 1940s and is just brilliant. Both the Little Bookroom and The Wind on the Moon almost made it on to their respective lists. If you haven't liked my facebook page yet, you should do so because I'm talking about the books I left off the list (and why). I always look forward to your comment each week because you've read so many of the books! We've read three from your list: Family Under the Bridge, The Children of Green Knowe, and The Wheel on the School. I've heard of all the others, but have yet to read them. I'd like to read my girls 101 Dalmations one of these days. I think they'd love it. And Clever Polly looks like fun. Wonderful O sounds similar to Ella Minnow Pea. It would be fun to do a comparison. I need to look for Karlson on the Roof! For some reason the only Astrid Lindgren book we have read is Pippi. Looks like I may need to add some other to our to be read list! Don't forget about The Children of Noisy Village. That's a wonderful book, too. One of my favorite books from the 1950’s was DAVID AND THE PHOENIX by David Ormondroyd. It was one of the Weekly Reader Book Club selections. A fun read. There was a book in the 50’s about a family of rabbits or mice. the mother told the child to be home on time or he would not get to go somewhere with them..he came home to a sitter…..I have been early to every app my whole life..
I’m afraid that doesn’t ring a bell. Good luck! As a child in Port Elizabeth, South Africa, during the 1950s I found a series of children’s novels set in Australia – to the best of my recollection – in a small town on the banks of a major river such as the Murray. The hero was a mischievous schoolboy who went, as is the Aussie custom, by his nickname; short and pithy, perhaps “Spike”. I cannot be sure which decade the novels were published in, certainly no later than the mid-1950s. There was nothing in the content to suggest a setting other than the mid-20th Century. The hero might have been Lockie Leonard in a different time and place but nevertheless quintessentially Australian. These stories fed into my childhood fascination with things Australian. I cannot remember any names of characters, landmariks; the author, or any of the several titles. I would dearly love to learn more of this writer and – I think – *her* work. Could it be “Told by Peter” by Mary Grant Bruce? I absolutely loved Carbonel growing that (Saying that, I’m young enough that the copy I own is a 50th Anniversary Edition.) Despite this, I just wanted to point out that I’m pretty sure Rosmary’s friend is called John, not Jack. Anyway, thank you for a lovely collection of era-based book recommendations – I can’t wait to read some of these. So happy I stumbled upon this site. Brings back memories! Would you know, was 101 Dalmations originally published as “The Twilight Barking”? They are intertwined in my memory. Hi, just wanted to drop you a note to say that I have really enjoyed reading your summaries of what children had on their bookshelves in different decades. I live in the UK and must admit I had not heard of Edward Eager before reading this post, but I was inspired to order a copy of ‘Half Magic’ and my son and I have really enjoyed it as a bedtime read. Thanks for the tip! Wonderful! I’m glad you found some new-to-you books! Happy reading! I’m so glad you enjoyed the lists! Happy reading! I am interested to find books I read as a child in the 1950s – they are about twins in various parts of the world and describe the lives and cultures of each place so beautifully. Any ideas on how to find these books gratefully welcomed!